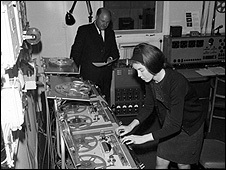 Delia Derbyshire was working in the BBC's Radiophonic Workshop in 1963 when she was given the score for a theme tune to a new science fiction series. 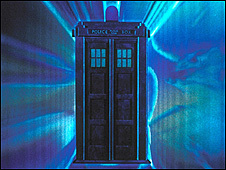 She turned those dots on a page into the swirling, shimmering Doctor Who title music - although it is the score's author, Ron Grainer, who is credited as the composer. Now David Butler, of Manchester University's School of Arts, Histories and Cultures has revealed for the first time the existence of 267 tapes found in Ms Derbyshire's attic when she died in 2001. They were, until last March, in the safekeeping of Mark Ayres, archivist for the Radiophonic Workshop - and have lain unheard for more than 30 years. Amongst the recordings is some ethereal whooshing from a 1969 production of Hamlet at the Roundhouse in London; an extraordinary kit of parts for one of her most-admired pieces; and the theme for a documentary set in the Sahara which shows how she used her voice as an instrument. Most unexpected of all, however, is a piece of music that sounds like a contemporary dance track which was recorded, it is believed, in the late sixties. Paul Hartnoll, formerly of the dance group Orbital and a great admirer of Ms Derbyshire's work, said the track was, "quite amazing". "That could be coming out next week on [left-field dance label] Warp Records," he noted. "It's incredible when you think when it comes from. Timeless, really. It could be now as much as then." Delia Derbyshire's voice can be heard introducing it. "Forget about this," she says, "it's for interest only." David Butler says: "She was a sculptor of sound, often recording found sounds." The next extract from the archives is a recording of her own voice, played forwards and backwards. It is the raw material for Blue Veils and Golden Sands - the documentary about the Tuareg people in the Sahara. The final version (right) contains cut up elements of her voice (which she jokingly referred to as a "castrated oboe"), and the sound of several electronic oscillators. The third recording from the archives features actor Nicol Williamson's legendary portrayal of Hamlet. Performed at London's Roundhouse, this excerpt captures a soliloquy set to Derbyshire's backdrop of eerie science fiction swooshes. "I find it spell-binding," says Hartnoll. "I've got a shedload of synthesizers and equipment, whereas Delia Derbyshire got out of the Radiophonic Workshop when synthesizers came along. "I think she got a bit disheartened and a bit bored with it all when the synthesizer came along and it all became a little too easy." Ms Derbyshire was well-known for favouring the use of a green metal lampshade as a musical instrument and said she took some of her inspiration from the sound of air raid sirens, which she heard growing up in Coventry in the Second World War. So what next for the 267 tapes she left behind? "The next thing that we want to do is make the archive available to everyone who wants to hear it," says David Butler. "But also this has to be a living, breathing archive so we are going to commission new works as well. "We hope to be able to commission works from contemporary electronic musicians and also those who worked with her - surviving members of the Radiophonic Workshop." 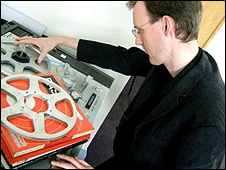 ↑ Lost tapes of the Dr Who composer on BBC News. This page was last modified on 11 June 2016, at 12:16.